From the time they learned the concept of gift giving for holidays or birthdays, my daughters have asked, “What can we get for you, Mom?” After all these years, my reply has not waivered. 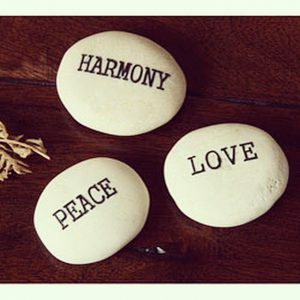 “Peace, love, and harmony.” I suppose this wish was initially in response to the occasional, inevitable sibling squabbles or mother-daughter clashes that were part of the fabric of our lives in their growing up years. Here we are some 15 or 20 years later and my adult daughters know better than to ask – they know, and understand, that all I wish for is peace, love and harmony. In our family, in our community, in our country, in our world. And now, I believe, they get it. In fact, if I were to ask them what was on their wish list – I would not be surprised if they responded in the same way. While each is still finding her way in the world, their materialistic needs are small. They know what is important in life. I am not immune to feelings of chaos, animosity and discord in my own life. My regular yoga practice has become essential in reminding me to let go. This mantra in mind and focus on the breath enables me to calm the mind. Have you given consideration to what your personal mantra might be? Perhaps you might find a way to incorporate it into your breath-work and practice. Warm wishes for peace, love and harmony in the new year. Namaste.